Victor Olofsson came barreling down the left side of the ice with the puck on the blade of his left-handed stick and the game on the line. The Buffalo Sabres winger unleashed a shot that sent the puck soaring over Detroit Red Wings goalie Jimmy Howard's head and gave his opponent possession. Moments later, Red Wings winger Tyler Bertuzzi one-timed a shot over a sprawling Linus Ullmark to send the Buffalo Sabres to a 5-4 overtime loss Thursday night in KeyBank Center. The 62 minutes, 18 seconds leading up to Bertuzzi's game-winner were a microcosm of one of the many problems that have plagued Buffalo all season: the roster has young, tantalizing talent that is prone to costly mistakes. Olofsson, the 23-year-old recalled one day earlier, had a team-high five shots on goal and recorded his first career NHL point by assisting on Jack Eichel's third-period goal, which erased their second two-goal deficit of the night. Yet, one mistake sent the Sabres (31-36-10) to their fifth consecutive loss and they are 3-15-3 over their last 21 games. Olofsson, a former seventh-round pick who was the Amerks' leading scorer, was one of three players to be recalled from Rochester this week and flourished while skating alongside Eichel and Sam Reinhart in his debut Thursday night. Lawrence Pilut, a 23-year-old defenseman recalled Sunday, had a plus-1 rating and played 21 minutes, 22 seconds with the Sabres missing Rasmus Ristolainen (illness) and Zach Bogosian (lower-body injury). A minus-2 rating was not indicative of how well defenseman Will Borgen, a 22-year-old who made his NHL debut Tuesday in Ottawa, fared during his 20 shifts against the Red Wings. Though 21-year-old winger Alex Nylander was also a minus-2, he had four shots on goal and nearly scored from atop the crease during a first-period power play. Casey Mittelstadt, a 20-year-old rookie center who was a healthy scratch Monday in New Jersey, scored his 12th goal of the season at 15:01 into the third period to cut the deficit to one goal. However, this was Olofsson's night. Shortly after Mittelstadt's goal, Olofsson collected a pass from Reinhart near the right-wing boards in the offensive zone, turned around to fire a centering pass once he heard Eichel call for the puck, and the Sabres' 22-year-old captain scored his 27th goal of the season and 100th of his career to tie the score, 4-4, with 4:18 remaining in regulation. "They bring a spark this time of year," Eichel said. "We talked the other night, everyone’s playing for something right now and I thought a lot of our young guys brought some really good energy and they fit right in. It was good to see that, on the back end all the way through up front. It’s good that we didn’t quit there, we were down two goals twice and we had some good resiliency, but it’s unfortunate." The Sabres were out-shooting Detroit, 11-1, before Johan Larsson, Pilut and Rasmus Dahlin took minor penalties in a span of five minutes, 35 seconds during the first period. Mistakes weren't limited to the rookies. The Red Wings (29-38-10) out-shot Buffalo, 16-4, over the final 12 minutes of the first period and took a 1-0 lead when Casey Nelson failed to tie up Bertuzzi in front of the net, allowing the forward to redirect a pass behind Ullmark with 7:58 remaining. 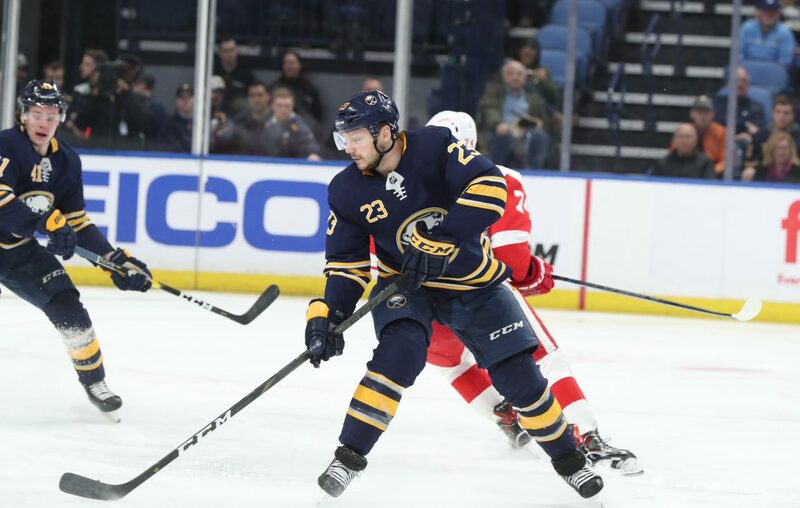 Detroit defenseman Filip Hronek pushed the lead to two goals one minute into the second period when only Olofsson hustled down ice to backcheck following a Sabres turnover. Kyle Okposo and Marco Scandella scored to erase the two-goal deficit, but Buffalo continued to struggle with details in its own zone. Dahlin, who has a minus-6 rating over his last five games, did not try to move Darren Helm from in front of Ullmark, when Dylan Larkin scored the go-ahead goal with a shot from the left circle at 6:44 into the third period. Dahlin then misfired a backhanded pass that hit off the side of the Sabres' net, and the Red Wings regained possession before Larkin scored again to give them a 4-2 lead with 6:56 remaining in regulation. "I really liked the way our young guys played," coach Phil Housley said. "(Olofsson) had a really good, strong game. Made some plays. Had some opportunities. Hit the crossbar in the third. Will Borgen continued to just be steady back there. Casey Mittelstadt, it was good to see he had some jump in his step. Lawrence had a very solid game. Dahlin, for the most part, I think he’d probably want that one back in the third, but those are the things you have to continue to fight through and learn." Mittelstadt and Olofsson helped the Sabres rally with two goals in a span of 41 seconds, only to lose on Bertuzzi's shot with 2:42 remaining in overtime. Still, it was a strong response after a 4-0 loss Tuesday in Ottawa. General Manager Jason Botterill has expressed the importance of patience and player development for the organization's future success. Buffalo has the fewest points since the 10-game winning streak had it sitting atop the NHL on Nov. 28. Progress from young players will arguably be more important than results in the final days of the season, as Botterill and his staff evaluate who could be part of the solution. "It’s good to have young guys around, because they have short memories," Housley said. "They want to make a difference. All their intentions are in the right place, they’re good people, they’re good teammates and they’re trying their hearts out."